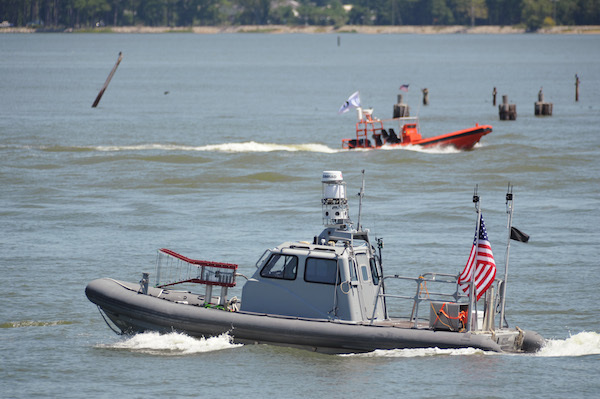 An unmanned 11-meter cabin rigid-hull inflatable boat operates autonomously during an Office of Naval Research-sponsored demonstration of swarmboat technology on the James River in Newport News, Va. During the demonstration, unmanned surface vehicles operate autonomously escorting a high-value unit while unmanned high-speed maneuvering surface targets, in background, simulate blocking access to a port facility. (U.S. Navy photo. ARLINGTON, Va. --- A technological breakthrough will allow any unmanned surface vehicle (USV) to not only protect Navy ships, but also, for the first time, autonomously "swarm" offensively on hostile vessels, officals at the Office of Naval Research (ONR) announced Oct. 5. The first-of-its-kind technology, successfully demonstrated over two weeks in August on the James River in Virginia, allows unmanned Navy vessels to overwhelm an adversary. Its sensors and software enable swarming capability, giving naval warfighters a decisive edge. "This networking unmanned platforms demonstration was a cost-effective way to integrate many small, cheap and autonomous capabilities that can significantly improve our warfighting advantage," said Adm. Jonathan Greenert, chief of naval operations. The technology, called CARACaS (Control Architecture for Robotic Agent Command and Sensing), is under development by ONR and can be put into a transportable kit and installed on almost any boat. It allows boats to operate autonomously, without a Sailor physically needing to be at the controls including operating in sync with other unmanned vessels, choosing their own routes, swarming to interdict enemy vessels and escorting/protecting naval assets. "Our Sailors and Marines can't fight tomorrow's battles using yesterday's technology," said Chief of Naval Research Rear Adm. Matthew Klunder. "This kind of breakthrough is the result of the Navy's long-term support for innovative research in science and technology." In the demonstrations, as many as 13 Navy boats operated using either autonomous or remote control. First they escorted a high-value Navy ship, and when a simulated enemy vessel was detected, the boats sped into action, swarming around the threat. In the future, the capability could scale to include even greater numbers of USVs and even to other platforms, including unmanned aerial vehicles (UAVs). "This multiplies combat power by allowing CARACaS-enabled boats to do some of the dangerous work," said Dr. Robert Brizzolara, program manager at ONR. "It will remove our Sailors and Marines from many dangerous situations -- for instance, when they need to approach hostile or suspicious vessels. If an adversary were to fire on the USVs, no humans would be at risk." The new technology will allow the USVs to detect, deter or destroy attacking adversaries. Any weapons fire from the USVs would need to be initiated by a Sailor supervising the mission. Naval leadership has emphasized a blended force of manned and unmanned systems in recent years. Not only can USVs take on dangerous missions, thus protecting the warfighter, but even multiple USVs are a fraction of the cost of a single large manned ship. The swarm demo announcement comes near the somber anniversary of the terrorist attack on USS Cole (DDG-67) off the coast of Yemen. In that October 2000 attack, a small boat laden with explosives was able to get near a guided-missile destroyer and detonate, killing 17 Sailors and injuring 39 others. Autonomous swarmboat capabilities could play a vital role in protecting people, ports and commerce. "While the attack on Cole was not the only motivation for developing autonomous swarm capability, it certainly is front and center in our minds and hearts," said Klunder. "If Cole had been supported by autonomous USVs, they could have stopped that attack long before it got close to our brave men and women on board."